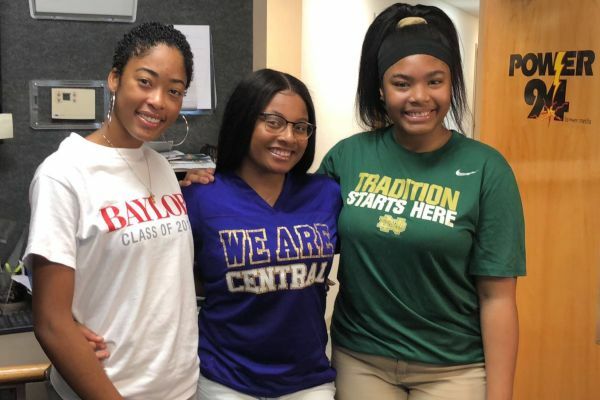 SOPHOMORE MADISON TAYLOR REPRESENTS CENTRAL HIGH AS TEEN REPORTER ON POWER 94 -- Madison Taylor (middle) prepares to report Central's events on Power 94. It takes a lot of spirit and pride when it comes to representing the school you attend. A student’s approach to their support for their academy comes in several distinctive variations. This support varies from sports, band, or volunteering. These measures of support all common in most schools, but some take it a step forward. Sophomore Madison Taylor expresses her school spirit as Central’s teen reporter on the radio at Power 94. She uses her platform to inform outsiders about the events over here at Central. Taking on this opportunity can foster a lot of pressure. A job like this requires you to to be charismatic and put yourself out in the open. Taylor is well aware of the weight that this position holds and was willing to take on the task. “I was happy since representing a whole school is a big deal because when I’m there they’re going to think how Central students act but it also impacted me positively because in my community we don’t have many young voices to represent us and gives us a chance to speak up for ourselves And by having this platform we get to shine a light on teens as a whole in the community just by being apart of this program,” Taylor expressed. Organization and structure is pretty crucial when carrying the role as reporter. “There’s not really a technique. They send us the schedule for what times people come in to record on Friday then I write the report including any school news, announcements, upcoming games, upcoming try out, if we had a game I include the score, and also a power player of the week to be recognized. Then I go in Saturday and say the report in the studio and Keith adds music to it so it can sound more upbeat and interesting,” Taylor verified. Her career path seems apparent due to the position she has taken on. The experience from this position will assist Taylor if she decides to pursue broadcast journalism as a profession. “I don’t think so as of right now seeing how much goes into the process behind the scenes. People at the radio station say I have a great voice and the personality for it so it should be something I think about just in case but I’m still going to use the things they taught me regarding my voice to use as a tool for public speaking,” Taylor divulged.